When it comes to marketing in this new media and social world Twitter is usually held up as the main force behind connecting with consumers and getting them to identify with brands. The question has been raised on more than one occasion about the validity of Twitter actually being a consumer recommendation engine for companies. Well it seems that this is a question that a recent survey from Constant Contact and Chadwick Martin Bailey tried to answer as they polled 1,491 consumers in the 18 and over demographic this past January 2011. It turns out, if their results are valid, that Twitter just might turn out to be a very good recommendation engine with 60% of those who follow a brand on Twitter will more than likely recommend that brand to their friends. If you get a Twitter user’s attention, they will be attentive for some time. Only 13 percent say they have unfollowed a brand after following it. Plus, 84 percent of respondents say they read the tweets coming from the brands they follow, so you’re being listened to if you get them to follow you. 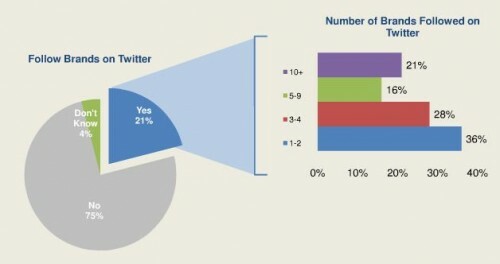 When it comes to age breakdown and who are consistent users of Twitter it is no surprise that they are mostly younger people. As you might have expected, it’s the younger crowd who is following the most brands on Twitter: 26 percent of those under 35 follow at least one brand, compared to 17 percent of those age 35 to 49 and 13 percent of those age 50 and over.